In a house with boys, I can't tell you the need for a staple gun. I use it to fix nearly everything, from jeans that have a tear as we are running out the door to school, to a project for Scouts that we need to finish. A staple gun is just a part of my life. 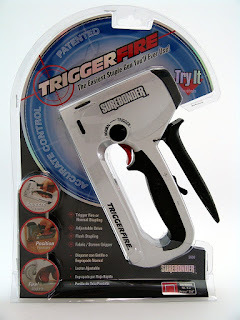 I recently had the opportunity to try out the TriggerFire Staple Gun by SureBonder, and I love it! It's SUPER easy to use. I love that I can use it one handed, because, let's face it, most of the time, I am trying to fix something by myself and have to use the other hand to hold the thing I am stapling! Trigger fire Staple Gun is a 1 of a kind staple gun and is the answer to all of your stapling needs. It is the first Trigger Activated manual Staple Gun. 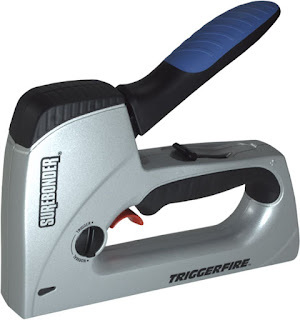 This unique tool allows trigger fire and normal stapling and uses the popular Surebonder #4 or arrow T50 type staples. Select the trigger mode (on the mode selector), using only 1 hand, squeeze the handle, position the stapler to the exact location you need to staple and pull the red trigger. It's as easy as that. For normal stapling, move the mode selector to normal. The tool also features a rubber head for a non-slip grip for flush stapling on hard surfaces. Uses are numerous but not limited to upholstery, screen repair, wire mesh, felt stripping, window covers, canvas and more. You can pickup this awesome staple gun at Home Depot or online at Amazon.com for about $18!